A once popular spice and medicinal plant, anise or aniseed (Pimpinella anisum) is an aromatic herb first cultivated in ancient Egypt and used primarily for flavoring food. But more important, the same natural chemical compounds that give anise seeds their rich flavor have been shown to have a beneficial action on human health. 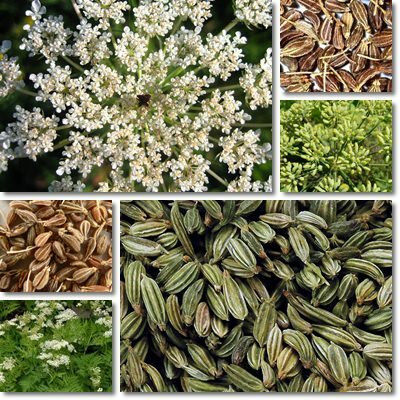 Anise seeds were once used for the treatment and management of a variety of conditions, ailments and medical upsets, mostly in the gastrointestinal range. The plant boasts antioxidant, antibacterial, antifungal, mildly analgesic, diuretic, hypoglycemic and carminative properties and is believed to have a relaxing effect on muscles, helping reduce pain associated with spasms such as colic. What does anise look like? First of all, it is important to make a clear distinction between anise (or aniseed) and star anise (or star anise seed), two different spices and herbal plants with shared medicinal uses and properties. The anise plant (Pimpinella anisum) is an aromatic flowering plant from the Mediterranean basin and Southwest Asia. It can reach 1 meter in height and has beautiful, feathery green leaves and tiny, beautiful white flowers grouped in umbrella-like clusters, hence its close resemblance to yarrow. The fruit of the anise plant, also called anise, aniseed or anise seed, is a tiny, 3-6 mm long greenish seed that turns brown when dried. What does anise taste and smell like? Anise seeds have a flavor somewhat similar to star anise, licorice or fennel seeds. This is because the plants all share certain naturally-occurring aromatic constituents, the most notable of which is anethole. Anise doesn’t really have a taste-proper (it isn’t spicy, sweet or sour), but rather a distinct licorice aroma. As a result, it is an acquired taste (see herbs and spices map). The properties and health benefits of anise (aniseed) are a result of its chemical and polyphenolic constituents, compounds that occur naturally in the plant, its seeds and derivate essential oil and engender a beneficial action on our health. The chemical constituents that give anise its flavor are: trans-anethole (up to 90% of the essential oil content), estragole, beta caryophyllene, anise ketone, limonene, alpha-pinene, anisealdehyde, cresol, myristicin, terpenes etc. Other health-relevant compounds in the plant and its essential oil are coumarins, polyacetylenes, terpene hydrocarbons, polyenes, umbelliferone, methyl-eugenol, not to mention fatty acids (oleic acid, palmitic acid). (Screening of antioxidant and antimicrobial activities of anise (Pimpinella anisum L.) (Chemical composition and antifungal effect of anise (Pimpinella anisum L.) fruit oil at ripening stage). 1) Useful for gastrointestinal problems. Anise seeds have been traditionally used for treating indigestion, relieving colic pain, flatulence and even nausea. More recent research reveals the plant may even protect against gastric ulcers (Aqueous suspension of anise “Pimpinella anisum” protects rats against chemically induced gastric ulcers). Anise tea, made from the fresh or dried ground seeds can be used for the same purposes. 2) Boasts antimicrobial action. Anethole, the main constituent in anise and anise essential oil has been found to be a powerful natural antibacterial, antifungal and antiviral agent. Water and methanol extracts of anise as well as simple anise essential oil have been shown to inhibit the activity of bacteria, molds and yeasts such as Salmonella enterica, Saccharomyces cerevisiae, Candida albicans, Staphylococcus aureus, Streptococcus pyogenes and Klebsiella pneumoniae. 3) Mild diuretic and laxative effect. A clinical study on 20 patients suffering from chronic constipation revealed anise and its derivate essential oil have a pronounced laxative effect and can decrease transit time, increase the number of daily bowel movements and improve overall bowel function without notable side effects (Randomized clinical trial of a phytotherapic compound containing Pimpinella anisum, Foeniculum vulgare, Sambucus nigra, and Cassia augustifolia for chronic constipation). Tea made by steeping either fresh or dried ground anise seeds has mild diuretic properties, supporting kidney function and promoting kidney health as well as benefits for hemorrhoids. 4) Exhibits anti-inflammatory and analgesic activity. An Indian study revealed anise essential oil has notable anti-inflammatory and analgesic effects, its effect being comparable to that of aspirin (Analgesic effect of Pimpinella anisum L. essential oil extract in mice) (Evaluation of analgesic and antiinflammatory activity of Pimpinella anisum fixed oil extract). Similar findings might explain why the plant and its derivate essential oil help relieve abdominal pain. 5) Offers antioxidant protection. Anise seeds, essential oil and various extracts have been found to exhibit a good antioxidant activity and protect cells and DNA against the harmful action of free radical molecules such as superoxide or nitric oxide. By ensuring cells carry on their normal activity, antioxidants protect us against disruptions that may cause cells to go haywire, live indefinitely and produce more of their kind, a process which often results in malignancies. 6) Natural expectorant and carminative. Anise and its derivate essential oil as well as anise seed tea have been long used for the treatment and management of common colds, bronchitis or other respiratory infections. The plant is believed to be an efficient natural expectorant with notable antiseptic properties. Fasting blood glucose is when blood sugar levels are measured after a period of about 8 hours spent without drinking or eating anything to reveal an accurate assessment of sugar levels in the blood. This pinpoints at anise as an excellent natural blood sugar-lowering agent and a future solution for preventing and managing type-2 diabetes. Although safe, anise is not recommended during pregnancy as it can potentially cause a miscarriage. Moreover, it can also trigger allergic reactions such as skin rashes, gastrointestinal problems or even breathing problems in particularly sensitive individuals. Anise essential oil in particular can irritate the skin up to the point that it causes small blisters and, if consumed in even small amounts, can lead to vomiting, pulmonary edema and seizures.